They show up in droves and represent some of coastal Carolina’s most-dreaded summer visitors. Fierce, aggressive and highly-destructive, they push up through the earth one mound at a time. By early September, fire ants have turned many yards into volatile, dirt-hill metropolises. At the same time, their bite can make a barefoot walk in the grass a painful trip to the ER for those that are allergic. Neither water nor mower blade seem to deter their path toward lawn dominance. Fact is, most people try to target the individual hills, only to find an even greater scattering of nests the next morning. It’s a decades-old battle, dating back to the 1920s when the fire ant was first introduced to the U.S. So how exactly do we rid ourselves of these invasive pests? Well, it starts with a full-spread approach. The goal is to destroy the mounds, as well as the elaborate tunnel system beneath the surface. While there are certain home remedies, we’ve found the most effective results come when a licensed professional uses the right product, applied at the right rate. 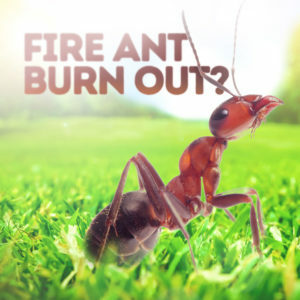 For example, our Turf Medic product and treatment plan actually creates a barrier in the soil that will control fire ants for up to one full year. If you decide to take on the fight by yourself, only to realize that you need some reinforcement, we’re here to provide field support!